Koreans have been assailing the beauty industry with their secret weapons one after another. After getting introduced to BB creams, C﻿﻿C crea﻿﻿ms, Skincare Essences, and C﻿﻿﻿﻿ushion Compacts, the US market is now getting familiar with the concept of ‘Ampoules’. For many years now, Korean beauty secrets have made huge waves in the beauty and skincare industry. Korean beauty products have been able to create a sense of credibility with their effective products. We have tried and tested a series of ampoules and came up with a list to help you choose in accordance with your skin issues. Skincare ampoules are the combination of highly concentrated active ingredients and enzymes that are typically used as an inoculation to the skin. Thanks to their high concentrations, the ampoules cannot be used on a long-term basis. They are well-known for their competency of reviving the skin or resolving a skin crisis. Ampoules come with specific formulations to address specific issues. For instance, antioxidants and snail secretions are used for skin moisturizing, Vitamin E and propolis extract in order to shrink and minimize skin pores and so forth. Ampoules come in different formulas to address different skin issues. As a result, it is important for you to address your skin issues first and then choose the right product for your situation. For instance, if you are having problems with wrinkles, then you should pick an ampoule with an anti-wrinkle formula. On the contrary, a repair ampoule will work best for damaged skin. 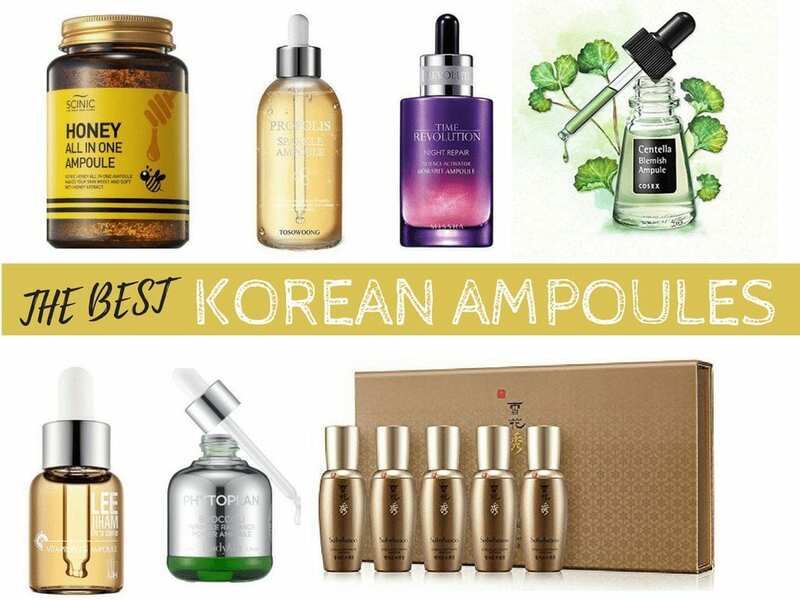 Most Korean ampoules are formulated with a combination of natural extracts and skin-friendly chemicals. Always make sure check out the list of ingredients in case you are allergic. The concentration of ingredients is another important factor in choosing an ampoule. You can pick lighter or thicker ampoules based on your preference. For the most part, ampoules contain highly concentrated ingredients. Many ampoules come with artificial colors, fragrance or other harsh additives that can prove to be harmful for your skin. Therefore, it is recommended to check the list of additives before making your final selection. Ampoules don’t usually contain any preservatives. As a result, the lifespan ampoules is pretty short. Make sure to follow the product instructions! Ampoules are used to target specific problem areas on your skin since they have a higher concentration than cleansers, moisturizers and serums. Do you love snail secretion for your skin, bee pollen, propolis, or honey? We fill you in on what the featured active ingredient is in each product so you can make the best choice! When it comes to Korean beauty products, they sure do take pride in their packaging. Many of these products come in different kinds of dispensers which make application that much easier. Keep an eye out for those that you feel like you can work best into your routine. Yes, we understand that buying international products can be a bit pricey. Sometimes, for the lucky few, this isn't always an issue for everybody. However, if you're trying to keep your wallet healthy as well as your skin, keep an eye out for this category. With skincare, the same products can create different results for different individuals. As a result, you cannot expect the exact same result with a single solution for every skin type. Furthermore, other issues like skin sensitivity and genetics also play an important role. A toner is a water-based styptic liquid that is used in order to reduce the oiliness and greasiness of the skin. Toners were basically formulated to replace the soaps. Soaps tend to increase the pH level of the skin. So, in order to avoid this harmful effect of soap, toners came into play with the intention of maintaining the skin pH at normal levels. However, these days we can maintain the skin's pH with any gentle face cleanser. Toners come with a range of skin-friendly additives and act as one of the key layers of the skin care regime. Serums are skin care liquid that is formulated with smaller molecules in order to penetrate the skin deeply and rejuvenate the skin from inside. It is recommended to apply serums after cleansing and toning the skin. However, you have to apply the serum before moisturizing. Similar to ampoules, serums are also created for specific skin concerns like wrinkles, fine lines etc. Essences and serums have a pretty thin line between them. The difference lies in their texture. An essence is basically the toned down version of a serum. When essences first came into the market, they were pretty lightweight and were used after a proper skin cleansing and toning. However, companies are making thicker essences in order to compete with the serums. Korea has long passed the basic essence phase! Now they are in the development of pre-essence and post-essence lotions! A booster is a assortment of ingredients that is applied in order to fight specific beauty issues. For instance, boosters can be mixed with moisturizers, masks or serums in order to boost their effect. The key difference between booster and other skin care solutions is that it is used as a secondary solution. Boosters complement other solutions. An ampoule is a highly concentrated solution that is known for its specific issue-oriented effects. Ampoules come from the same family as serums and essences. Ampoules come in different concentrations depending on the ingredients. This varied concentration differentiates them from serums and essences. 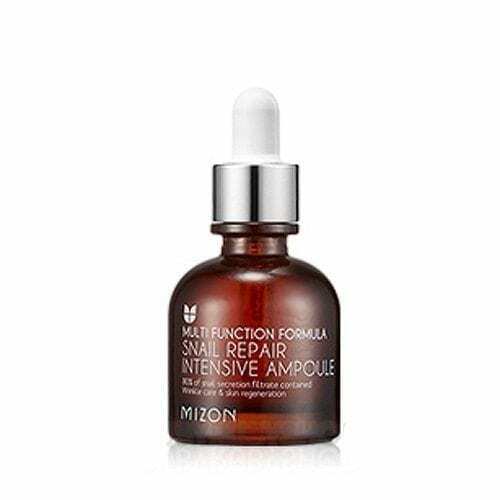 Our top ampoule pick is the Snail Repair Intensive Ampoule from the famous Korean skin care brand, MIZON. It is developed for those who want to treat wrinkles and aging skin. With continuous research and development, MIZON has created an effective product line up to fight against various skin issues. This natural and highly effective ampoule is another great addition to their product line. MIZON formulated this particular ampoule with the extremely efficient snail secretion. This formula contains around 80% of snail secretion filtrate. Snail secretion is great for addressing anti-aging issues like wrinkles and fine lines. This multi-care formula will help you to fight against reddish, sensitive and stressed skin, large pores, dark and dry skin, damaged skin, acne scars, and wrinkles. This paraben-free ampoule does not contain any additives like artificial colors or fragrance. This ampoule also soothes and nourishes the skin. The thick, sticky and elastic texture of snail secretion delivers nutrition quickly to the skin. Another key aspect of this multi-care formula is its skin brightening effect. With all natural and effective snail extract, the multi-care formula, strong protection against anti-aging, skin brightening and soothing properties, this is undoubtedly one of the must have ampoules on the market. If you are looking for a natural skin restorative solution for your dry and damaged skin, then check out the Herblinic Restorative Ampoules from Sulwhasoo. This particular ampoule is formulated with a series of natural ingredients: Red Ginseng, Milkvetch Root, Mugwort, Cnidium Officinale, and Angelica. Red Ginseng penetrates deep inside the skin to strengthen and energize it from the inside. The Milkvetch Root protects the skin from harmful external factors like UV rays and free radicals. Mugwort is known for its effect on skin metabolism and vitamins. The Cnidium Officinale can help to remove toxins from the skin and finally the Angelica works to moisturize the skin. It has a thick and creamy texture. The solution is brownish in color and it has a strong herbal aroma to it. The package contains 5 tubes of Herblinic Restorative Ampoules. It’s a well-planned 5-week home treatment plan to fight against damaged skin.The Herblinic Restorative Complex can restore the damaged skin and bring the skin back to its natural balance. Thanks to its thick and dense texture, the complex also promotes skin nourishment over and above the layered protection against external aggressions. The solution also works great for oily and acne-prone skin. 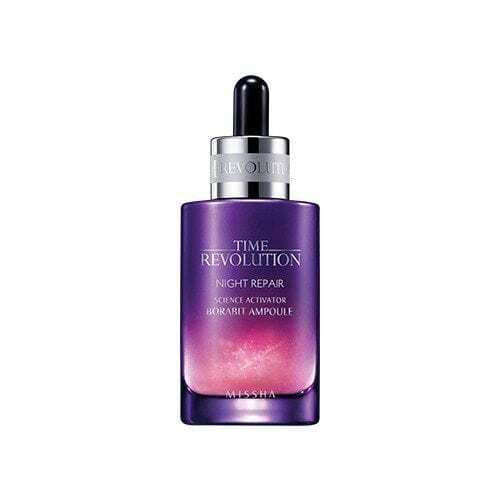 If you are looking for a skin energizer along with basic skin nutrition and moisturizing, check out the Time Revolution Night Repair Ampoule from Missha. They came up with a solution for your night time routine in the form of an ampoule. This particular ampoule contains natural ingredients like Fermented Bifida, Lactobacillus Ferments, Lacto Coccus, and Saccharomyces Ferment Filtrate. Bifida Ferment is known for its strength to prevent damage from harmful environmental factors. It creates a strong barrier on top of the skin and guards it firmly. Lactobacillus Ferment contains skin-friendly ingredients like Peptide and Vitamin B12. These elements can promote a healthy and improved skin conditions. Saccharomyces Ferment Filtrate contains antioxidant properties in addition to natural protective elements. As a result, this ferment filtrate can help to moisturize the skin to have a firmer skin tone. Moreover, the protective elements help the skin in strengthening the natural barrier. The all-natural fermented ingredients treat anti-aging issues like wrinkles and fine lines. It also works wonders in skin whitening and elasticity restoring. Even though it is titled as night repair, you can also use it during the day. With it's unique and efficient natural components and effects like wrinkle repairing, skin whitening, skin energizing, and skin moisturizing, this ampoule is a must have for your beauty regime. 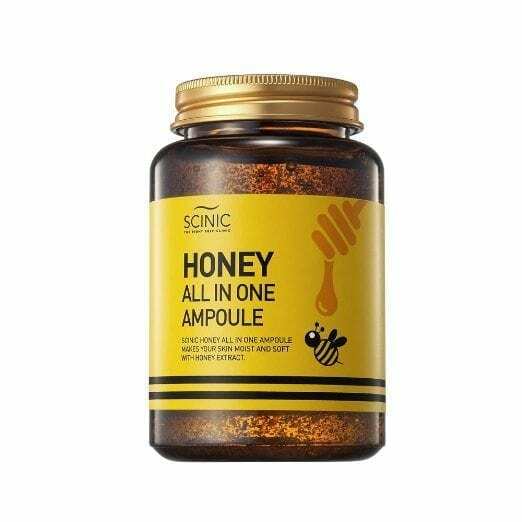 Next up is an all in one ampoule formula for all skin type from SCINIC, popular for it's unorthodox formulation. While every other company is focusing on producing sticky solutions, SCINIC developed a non-sticky solution. Also, SCINIC promises users that they don’t need to follow the popular toner-ampoule-serum/lotion process! The base ingredient of this particular ampoule is honey extract with 90% of honey extract. In addition, a series of natural elements and extracts were added into this formulation. Propolis Extract, Royal Jelly Extract, Green Tea Extract, Camellia Sinensis Leaf Extract , Centella Asiatica Extract, Licorice Root Extract, Camomile, Korean Knotweed, Rosemary Leaf Extract, and Gold were used to formulate the solution together with the honey extract. Use a spatula to spread the ampoule onto your face after washing your face. Afterward, spread the ampoule on the face and neck softly. For a better assimilation, it is recommended to tap on the face lightly. There is no mention of the use of toner after wash or serum after the ampoule. yay! 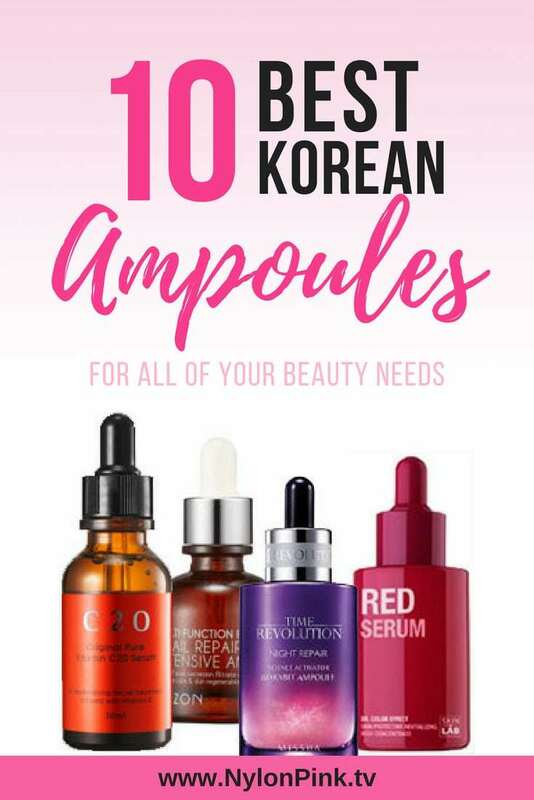 With highly concentrated natural ingredients, a simple one-step skincare process, and skin whitening, this is one unique and highly efficient Korean ampoule! 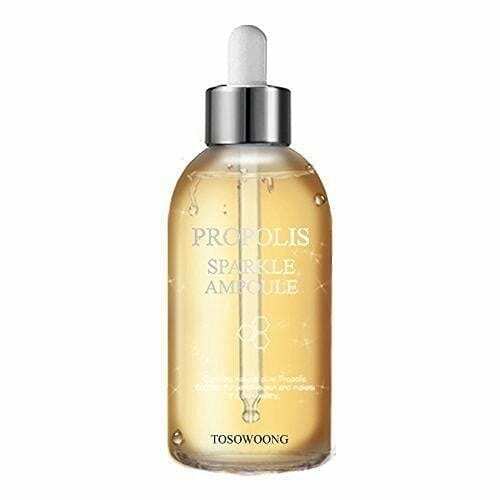 Tosowoong came up with a brilliant idea to fight against sensitive skin issues with their all-natural secret formula with their ‘Propolis Sparkle Ampoule’. As you might have already guessed, Propolis Sparkle Ampoule is formulated with propolis as the base ingredient. Propolis is a red or brown compound that is collected by the honeybees from tree buds. The honeybees use this substance to fill the fissures of the honeycombs. Honeybees mix propolis with their saliva and enzymes in addition to vegetable drain and pollen. This solution has the strength to protect itself from various harmful elements. As a result, this unique substance can help to protect the skin from harsh environmental changes. It can make the skin more firm and elastic. The ampoule can offer a super moisturizing effect via providing some essential vitamins and nutrients for the skin. The moisturizing and elastic effects come from the 80% concentration of propolis. With unique ingredients and Korean formulation, it works wonder for sensitive skin. If you are looking for a natural solution for all those annoying blemishes check out the Centella Blemish formula from Cosrx. Cosrx is always trying to find natural solutions to skin issues. 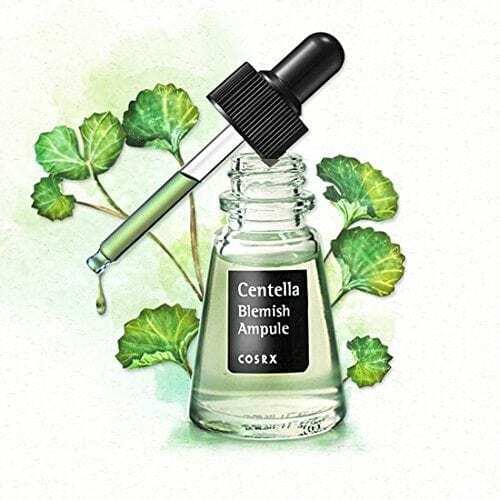 The Centella Blemish Ampoule is designed for troubled skin, especially blemishes. Centella Asiatica is a natural plant, known for its anti-inflammatory properties and it's the base ingredient used to formulate this ampoule. With its anti-inflammatory properties, Cosrx made an ultra-hydrating solution that fights hard against blemishes. In addition to the Centella Asiatica leaf water, this particular solution also comprises of Centella Asiatica extract and Copper Chlorophyllin-Copper Complex that helps the solution to get absorbed in the skin quickly. It also works wonders with acne-prone skin.When it comes to the ampoule application, it is recommended to apply one to two drops onto the face and then massage the face skin gently. With the addition of Centella Asiatica leaf water and extract, it's easy to spread texture and incredibly soft and hydrating properties, it is one of the best ampoules available. How would you like a multi-tasking ampoule that can revitalizes the skin while maintaining a smooth and improved skin texture? It would be awesome, right? 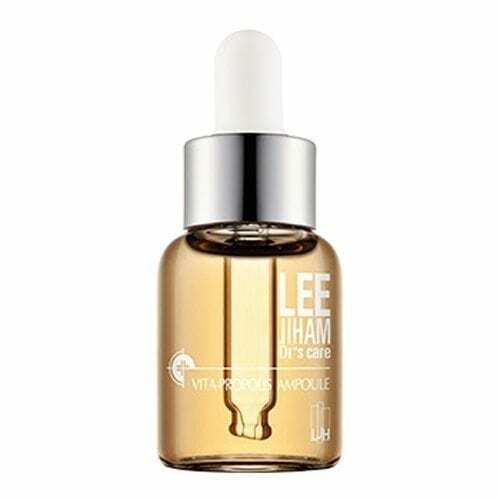 Well, your troubled days are now over with Dr. LJH LEE JI HAM’s Care Vita Propolis Ampoule. Dr Lee Ji Ham was the pioneer in combining cosmetica with pharmaceutical products in Korea. Dr Lee Ji Ham Cosmetics are known for their thorough research on different skin issues before coming up with a solution. This particular ampoule is formulated with Propolis as the base ingredient. Besides the propolis extract, a series of natural vitamins were added into the formulation: Centella Asiatica, Sea Buckthorn extract, Witch Hazel extract, and the Rose extract. The concentration is 50% of Propolis extract, 10% of Vitamin, 26% of Centella Asiatica & Witch hazel extract and finally, 10% of Sea buckthorn extract. Propolis extract is acclaimed for its protective and skin nourishment attributes while vitamins play an important role in making the skin healthier. Centella Asiatica and Witch Hazel extract can soothe the skin and eliminate the pores. According to the Dr Lee Ji Ham Cosmetics, it is recommended to use the ampoule immediately use after cleansing and toning for a better result.With some amazing ingredients and outstanding results, this is a must-have ampoule to anyone’s skincare routine. If you want some special fighting power against wrinkles, dry, damaged and itchy skin, then a single solution can go a long way. 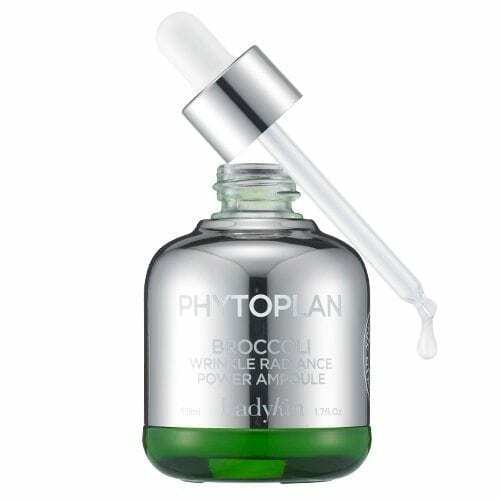 The [LadyKin] Phytoplan Broccoli Wrinkle Radiance Power Ampoule use the power of nature to battle with issues like wrinkles, fine lines, distressed and damaged skin. What’s more, it can brighten up your skin at the same time. For the most part, this solution is formulated with Broccoli Extract. The 75% of broccoli extract will help to alleviate skin stress in addition to providing vitamin, mineral, and moisture to dry skin. Overall, it contains 18 different kinds of vegetable extracts. Other than the five superfoods (broccoli, Almond, Blueberry, autumn squash, and orange), it also contains raspberry extract, Allantoin, Hyaluronic acid, Shea butter. The Niacinamide and Adenosine will help the skin with their whitening and anti-wrinkle effects. It has some strong protective power thanks to the Bamboo leaf extract. It can be applied after the use of cleanser and toner. With its all-natural properties, it can easily replace vitamins serums, anti aging or anti wrinkle serums and creams in addition to skin brighteners. This ampoule is a no brainer for anyone who cares for their skin, with 18 kinds of vegetable extracts and many with dual functional properties. 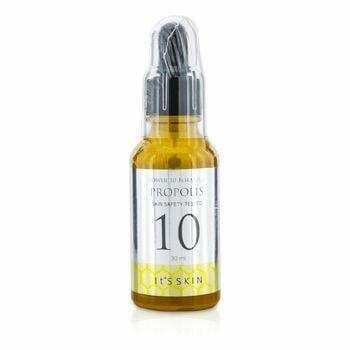 If you want a nutrient-rich highly concentrated solution that can protect and heal your troubled skin, then check out the Power 10 Formula with Propolis from It's skin. With it's formulation of propolis extract, it can protect your skin with its anti-inflammatory, anti-oxidant properties and brighten the dull skin simultaneously. This ampoule is mainly formulated with Propolis Extract, Honey Extract, Sea Water, Rosa Centifolia Flower Extract, Daisy Flower Extract, and Freesia Refracta Extract with a combination of skin-friendly chemicals. The concentrated nutrient-rich Propolis Extract can protect the skin from stress & environmental pollutants. The combination of Propolis Extract and Honey Extract in addition to other natural extracts help with the skin whitening. Also, it helps with shrinking large pores to unveil a clearer and brighter skin tone. With continuous use, users can have a moist & healthier looking complexion.For the best result, first, the users need to cleanse and tone their skin properly. After the toning, the users have to take two to three drops of this solution on the palm. Next, they need to rub the palms together in order to warm the ampoule. Subsequently, the users have to pat the palms on their face until the solution is fully absorbed. The users can follow it up with lotions or moisturizers.With nutrient-filled natural ingredients, skin brightening effect, thick and milky consistency, it is a great ampoule formula altogether. rose, argan, honey, or olive. 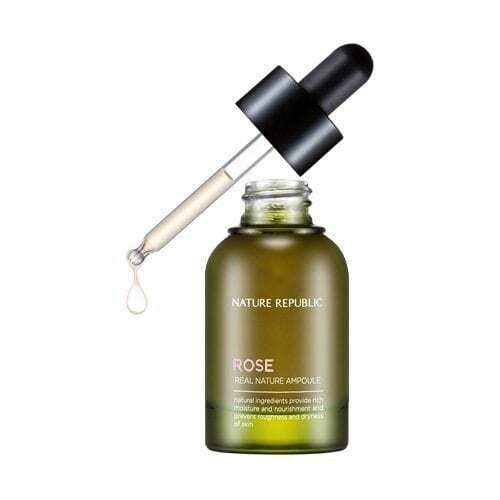 In you suffer from rough and dry skin and are looking for a natural moisturizer, then the Real Nature Ampoule from Nature Republic is a great pick for you. Nature Republic is a brand that cares a lot about natural and eco-friendly ingredients. This ampoule comes in 4 different featured ingredients: rose, argan, honey, or olive. This ampoule is formulated with Argan, Honey, Rose, and Olives. Argan can provide skin with rich moisture and nourishment while preventing roughness and dryness of skin at the same time. Moreover, argan oil is filled with Vitamin E and omega components. They supply sustenance to dry and rough skin. Honey is known for its moisturizing essence. It makes the skin smoother. It also helps with the wrinkles and fine lines of the skin. Rose improves the elasticity of the skin whereas olive supplies nourishment via hydrating the skin. The consistency of this solution is somewhat thicker than water. As a result, it spreads and gets absorbed quite easily. It has a rosy aroma to it. It is recommended to use this solution after toning the skin properly. Three drops and you can have a hydrated, brightened and freshened skin on the whole. If you feel any rashes or skin irritation, you should stop using it immediately. With a series of natural ingredients, skin nourishment and skin brightening effects, this is a great pick for skincare aficionados.